Can’t get enough of the Disney Parks? Here are 15 Instagram Disney Accounts You Should Be Following to help make your day magical. Of the many social media platforms available today, Instagram is hands-down my absolute FAVORITE! I love telling stories through photos. Instagram is the perfect way to showcase our daily adventures in life whether it be travel, food or family. The new Instagram Stories feature is a fun way to chronicle our adventures too. Instagram is a great means for inspiration as well. Disney has my heart. 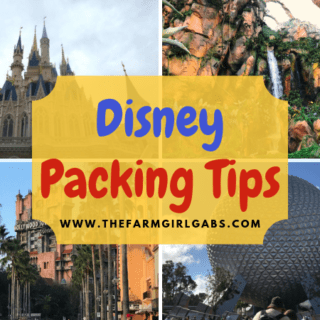 I know that is probably no surprise at all since I write a lot about Disney here on The Farm Girl Gabs. I like to follow a lot of different Disney accounts too so I can feel like I am in the mix of magic and pixie dust, get story ideas for the blog and to research what I will eat, see and drink on my next visit to the Happiest Place on Earth. I am a photo snap happy freak when I visit the parks. It keeps me on my toes and my family rolling their eyes. Since Disney is a pretty popular hashtag on Instagram, I thought it would be fun to share some of my favorite Disney-inspired accounts with you. I am so lucky that my bestie Gina shares the same love for Disney too. We recently started our own Instagram page called Sweet Disney Delights. I hope you will follow along on our Disney adventures as well. Here are 15 Instagram Disney Accounts That I Love Following! What are your favorite Disney Instagram accounts? Did I miss any great ones? Leave a comment below and let me know. I am always looking for new folks to follow.